MADAM CHANCELLOR, a philanthropist and entrepreneur, UBC alumnus Michael Audain has a long history of social activism, community development and generous support of the visual arts and culture in British Columbia. 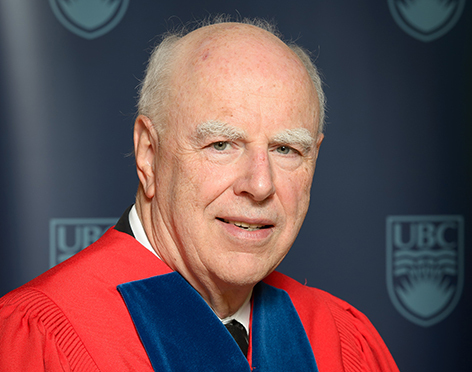 Mr. Audain’s dedication to improving communities began in the early 1960s, when he was a UBC Arts student researching residential segregation in the American South. His interest in the civil rights movement prompted him to actively support the group famously known as the Freedom Riders, and their peaceful protest of segregation laws. After spending a month in a Mississippi prison, he returned to UBC, where he co-founded the BC Civil Liberties Association in 1962 and later completed a Master’s degree in Social Work. He subsequently undertook a series of appointments as a social worker, agricultural economist and housing policy specialist with the Ontario Housing Corporation and the Canadian Council on Social Development. With enduring ambition in community development, he later founded Polygon Homes Ltd, one of British Columbia’s most successful homebuilders. In 1987, he established the Audain Foundation for the Visual Arts in British Columbia, with a goal to promote the visual arts in BC and Canada. His foundation’s support has been extended to numerous British Columbia universities and galleries, including UBC, where among many examples of philanthropy and volunteer service, he has enabled the creation of the Audain Arts Centre to engage students and the community in learning opportunities and gallery events. He has also served as Chair of the Board of the National Gallery of Canada and is a Trustee and Past President of the Vancouver Art Gallery, as well as Chair of the Vancouver Art Gallery Foundation. For his efforts and contributions, Mr. Audain has received many formal honours, including his appointment to the Order of British Columbia and as an Officer of the Order of Canada. Madam Chancellor, in recognition of his record of community service, and for enriching the cultural heritage of our province and nation, I ask you to confer the degree Doctor of Laws, honoris causa, upon MICHAEL JAMES AUDAIN.